Having been born and raised in the Los Angeles area, I had to drive quite a ways to get to and from Berkeley during my breaks. Luckily, I like driving, and I liked the sensation of starting the journey on the 5: setting out before the dawn and entering the hills and valleys of Angeles National Forest before emerging from the Grapevine on the other side. I liked driving through the grand expanse of land that is the Central Valley, that incredibly rich swath of earth from which much of this nation’s produce is coaxed. I am always reminded of my mother’s roots in the South Korean countryside, of growing up on a country estate. We didn’t get too much greenery in Alhambra, California, so the abundant agriculture of the Central Valley always amazed me. This personal observation leads me to believe that it’s hard for people to “outgrow” their roots. No one certainly tried harder than Mr. Jean-Luc Matha, a winemaker in the little-known appellation of Marcillac, France. He studied to be a priest, then gave that up to become a clown. I guess clowning around didn’t appeal to him after a while, so he returned to the earth and started to make wine. Everyone has heard of Bordeaux and Burgundy. Many people have heard of Cotes-du-Rhone, and many people are starting to try wines from the Languedoc, Touraine, the cru Beaujolais, etc., etc. There are still these obscure little appellations that, given advances in technology and refinements in winemaking philosophy, are beginning to make noteworthy and outstanding wines. 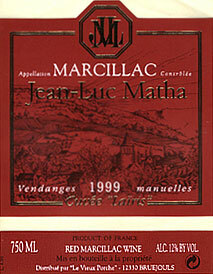 Mr. Matha was the first in Marcillac to reduce yields and focus on quality. His grape of choice is the native varietal mansois. While others in the area use mansois and small quantities of cabernet sauvignon, cabernet franc, gamay, etc., Matha’s two main wines are 100% mansois. I picked up a bottle from Mission Wines for about $12 or $13. I was thinking about cooking pork chops with paprika, and every description online of mansois stated it had a noticeable perfume of paprika, spices, and pepper. Intriguing. I ended up not cooking pork–rather, I found that my brother had jumped the gun and made his famous seafood pasta: linguine with mussels and crab meat, seasoned with basil, tomato, garlic, and olive oil, thickened with some heavy cream. Delicious. The “Cuvée Lairis” was a wonderful match, lighter bodied–almost like a gamay–with an opaque, raspberry color. The hints of paprika and spices were there in the nose and present upon the tasting. Good berry fruit, persimmon, a dash of pepper… light tannins. I chilled it in the fridge for about 15 minutes before drinking, which made it very refreshing. Excellent wine–not crazy-complex but unusual and satisfying. The children of France may be missing their clown, but I’m certainly glad Jean-Luc Matha returned to his roots!